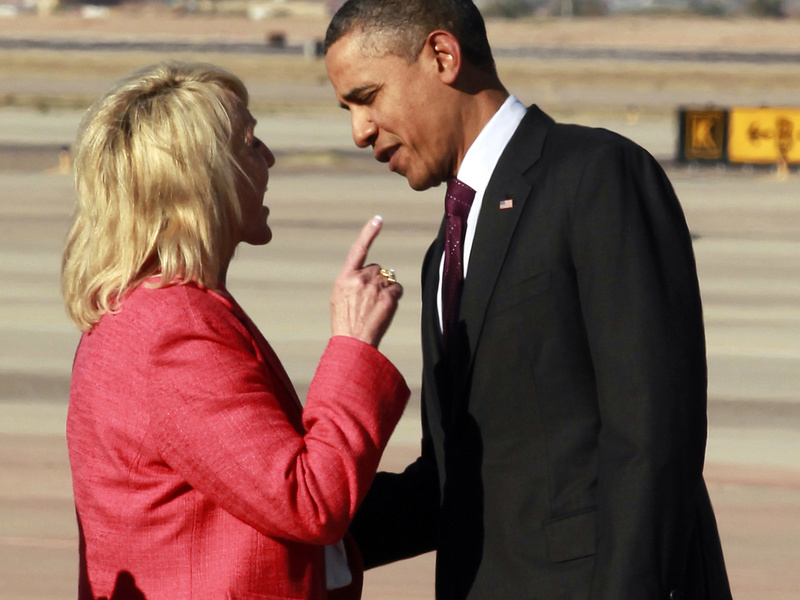 Jan Brewer gets an earful from Obama in Ariz.
MESA, Ariz. - Arizona Gov. Jan Brewer came to greet President Obama upon his arrival outside Phoenix Wednesday. What she got was a critique. Of her book. The two leaders could be seen engaged in an intense conversation at the base of Air Force One's steps. Both could be seen smiling, but speaking at the same time. Asked moments later what the conversation was about, Brewer, a Republican, said, "He was a little disturbed about my book." "We could have been talking about a million different things," Brewer told reporters. "Bottom line is that he generally wants to talk about amnesty and I want to talk about securing our border." Brewer recently published a book, "Scorpions for Breakfast," something of a memoir of her years growing up, and defends her signing of Arizona's controversial law cracking down on illegal immigrants, which Obama opposes. CBS News chief White House correspondent Norah O'Donnell reports it was the body language from their chat which has tongues in Washington wagging. Brewer got right to the point - pointing her finger at the president on the airport tarmac during their exchange. "I will say that a picture is what it is," Brewer added. "I must say, I was not hostile. I was trying to be very, very gracious. I respect the office of the president, and I would never be disrespectful in that manner." However, O'Donnell says Brewer took a different tack during an appearance on Fox News' "On the Record" with Greta van Susteren, saying she couldn't understand why Obama was surprised by her book, and calling him "very thin-skinned." "I said that I was sorry that he felt that way. Anyway, we're glad he's here, and we'll regroup." A White House official said Brewer handed Obama a letter and said she was inviting him to meet with her. The official said Obama told her he would be glad to meet with her again. The official said Obama did note that after their last meeting, which the official described as a cordial discussion in the Oval Office, the governor inaccurately described the meeting in her book. The official spoke on condition of anonymity to describe a private conversation between the president and the governor.